NASCAR drivers make a big difference off the track and in communities across the country. Here’s a look at drivers’ charitable foundations, as well as the causes and initiatives supported by those organizations. The 79 Fund was established by NASCAR driver and Emporia, Kansas, native Clint Bowyer to benefit the children of Emporia. Clint’s desire to use the Emporia Community Foundation for his charity came from knowing the funds could be used in a variety of ways to help the children of Emporia. | Learn more here. The Kyle Busch Foundation is committed to empowering children, families and communities to overcome hardship by providing essential tools (financial, material and experiential) to allow them to live their best lives possible, while fostering a stable and inspiring environment to live, learn and challenge themselves, as well as ensuring their day-to-day needs are met. | Learn more here. The Dale Jr. Foundation is a charity dedicated to giving underprivileged individuals with a focus on youth, the resources to improve their confidence and education, and the opportunity to achieve extraordinary goals. | Learn more here. The Denny Hamlin Foundation is committed to raising awareness and funds for the specific needs of children with cystic fibrosis. They partner with organizations that focus on cystic fibrosis research, treatment advances and overall quality of life care. The Foundation also supports children with other chronic diseases. | Learn more here. The mission of the Kevin Harvick Foundation is to support programs that positively enrich the lives of children throughout the United States. | Learn more here. 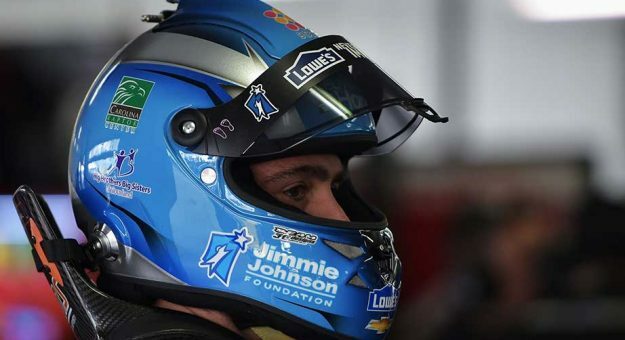 The Jimmie Johnson Foundation currently focuses on funding K-12 public education, primarily through the Jimmie Johnson Foundation Champions Grant program, which have been awarded to school projects located in California, Oklahoma and North Carolina, where the Johnsons grew up and currently reside. In addition, each year the Foundation selects five charities that support K-12 public education to be featured on Johnson’s Blue Bunny Helmet of Hope. Blue Bunny Helmet of Hope charities receive a cash grant and national exposure on the helmet worn for a select Cup race. Finally, the Team Up For Technology program encourages individuals to nominate a K-12 public or charter school in the United States with the winning school selected to receive a $48,000 cash grant for a technology makeover. | Learn more here. The Kasey Kahne Foundation is committed to raising awareness and funds for charities supporting chronically ill children and their families. The Kasey Kahne Foundation strives to empower youth and inspire their future through education by donating to programs dedicated to fulfilling children’s needs for success. | Learn more here. Brad Keselowski‘s Checkered Flag Foundation strives to support those who have sacrificed for our country, to include military members, veterans, first-responders among others. Since its inception, CFF has hosted or participated in events with the Wounded Warrior Project, the Armed Forces Foundation, The Paralyzed Veterans of America, the National Fallen Firefighters Foundation and the Detroit F.I.R.E. benefit team. | Learn more here. The mission of the Joey Logano Foundation is to inspire and assemble the NASCAR community to assist those across the nation who are in need of a second chance due to natural or human disaster. The Joey Logano Foundation partners with other organizations to provide comfort and relief to those in need after such unforeseen circumstances. | Learn more here. Formed in 2012 on 87 acres in Statesville, North Carolina, Rescue Ranch promotes humane education by focusing on rescuing on a fundamental level through hands-on learning and care for animals. Rescue Ranch promotes, through its education, respect for all animals, as well as, agricultural, environmental, and wildlife conservation, and facilitates rehabilitation, rescue and responsible pet ownership in order to enhance the human-animal bond. | Learn more here. The Hermie and Elliott Sadler Charitable Foundation is dedicated to raising autism awareness and promoting research for a cure while also supporting initiatives that improve educational opportunities for children and their families. The Foundation provides support to projects that share the ideals and concerns of the Sadler family. | Learn more here. The Martin Truex Jr. Foundation raises awareness and funding for childhood and ovarian cancer initiatives. | Learn more here.